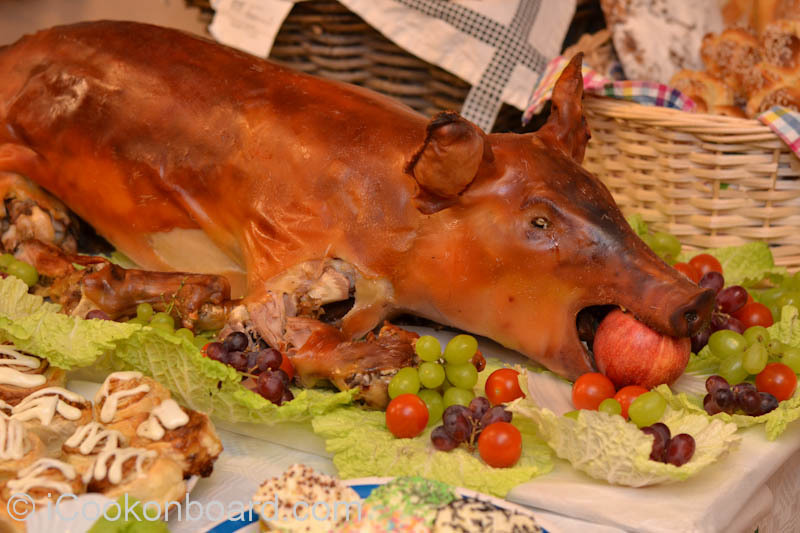 A Filipino Noche Buena and Medya Noche celebration won’t be complete without the Lechon de Leche. It is the star of the dinner table. Family members waited all year long for this bountiful midnight feast. 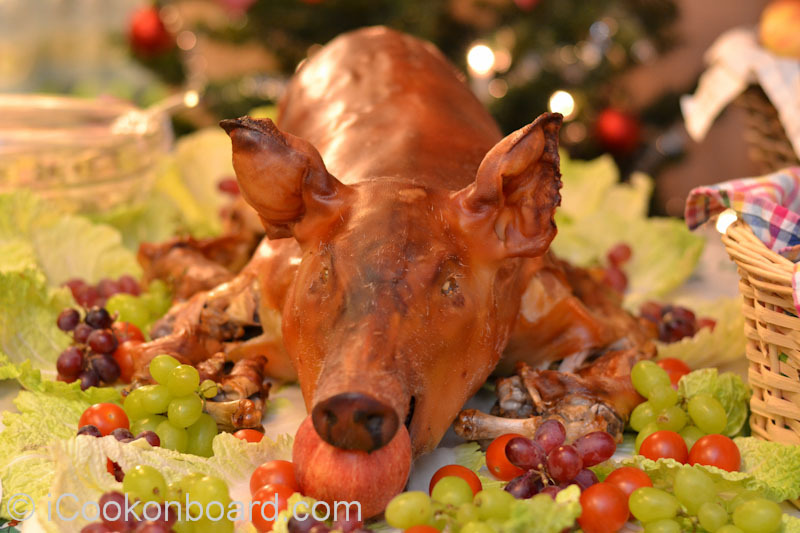 Tis the time of the year to feast on the Lechon de Leche and enjoy all the blessing on your table. 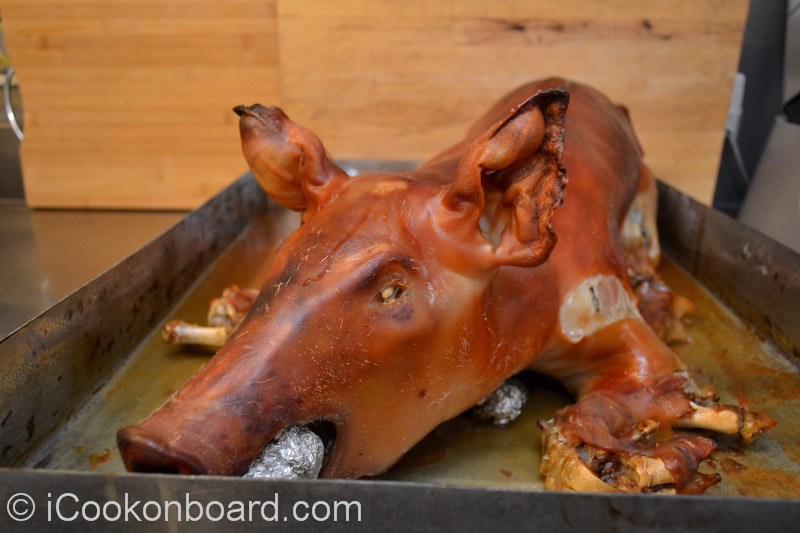 At home, Lechon de Leche is traditionally skewed in bamboo and grilled slowly on charcoal. Every provinces in the Philippines have their on way of preparing and seasoning their Lechon de Leche. In my hometown, Biñan, Laguna. We normally season the Lechon de Leche with seasalt and freshly ground bleck peppers. Skewed on a large bamboo, then stuff the suckling pig stomach with tamarind leaves and rub the pig’s skin with evaporated milk. Keep it aside for a couple of hours to air dry the skin and for the excess blood to drip-off. Cooked on slow fire of charcoal for 3 hours while constantly rotating it. In Tagalog we call it “Lechon Pihit”. 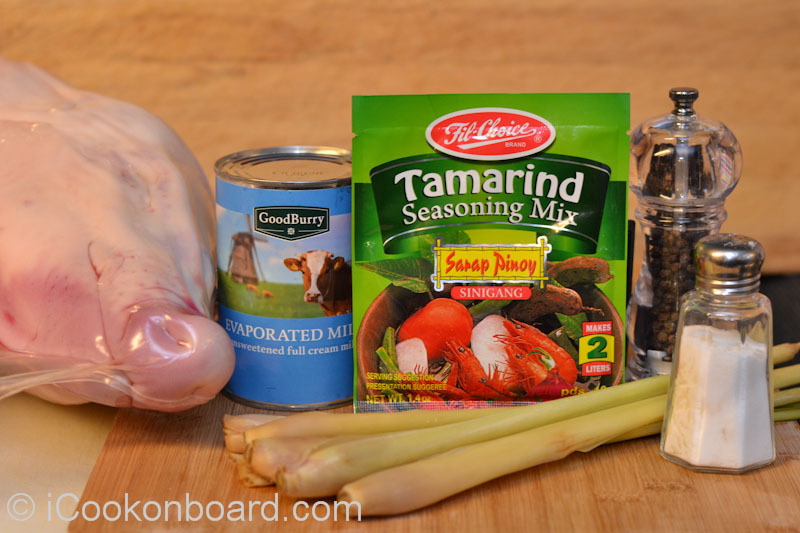 For this recipe, we will use tamarind soup powder to immitate the tamarind leaf taste. And I also use lemongrass to enhance the taste. 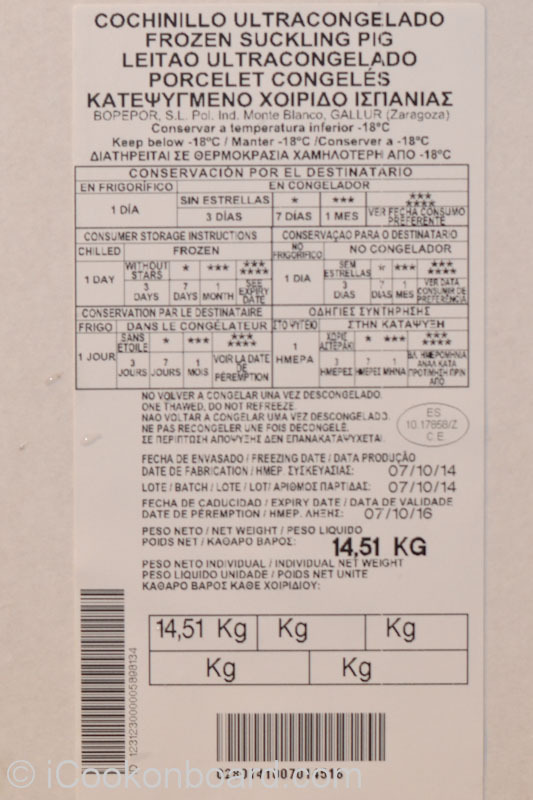 Thaw the frozen suckling pig inside your vegetable room at 4’C for 2 days. 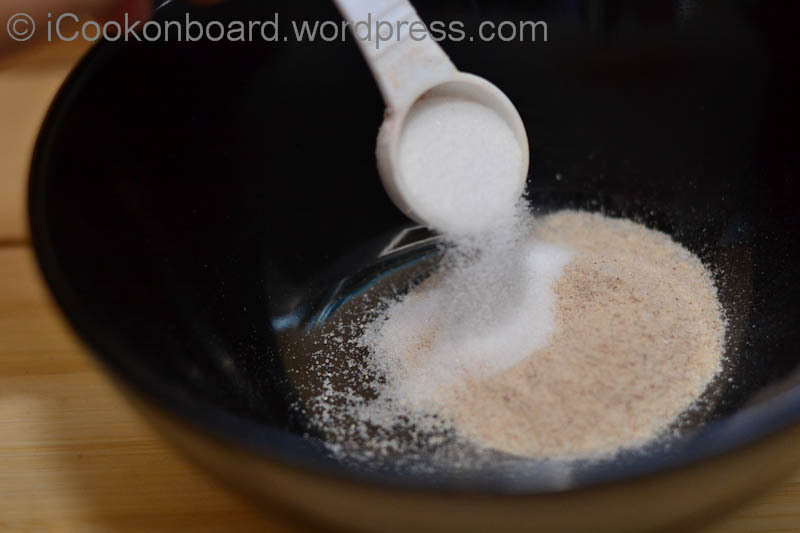 Mix the tamarind soup powder and #Seasonin in a small bowl. Make a slit inside the thick part of the suckling pig legs. Rub the tamarind seasonin mixture inside the suckling pig. Crumple the alluminum foil into small balls and place inside the suckling pig stomach and neck until it is well stuffed. Lastly, brush the suckling pig with the evaporated milk and water mixture. Preheat the oven to 180’C. Place the suckling pig on a very large tray. Roast for 3 hours. Checking every 45 minutes to see which area is browning. Cover these areas with alluminum foil to avoid it from burning. Normally, the ears will brown after 45 minutes, then the head and the top side of the pig will start to brown 45 minutes more. 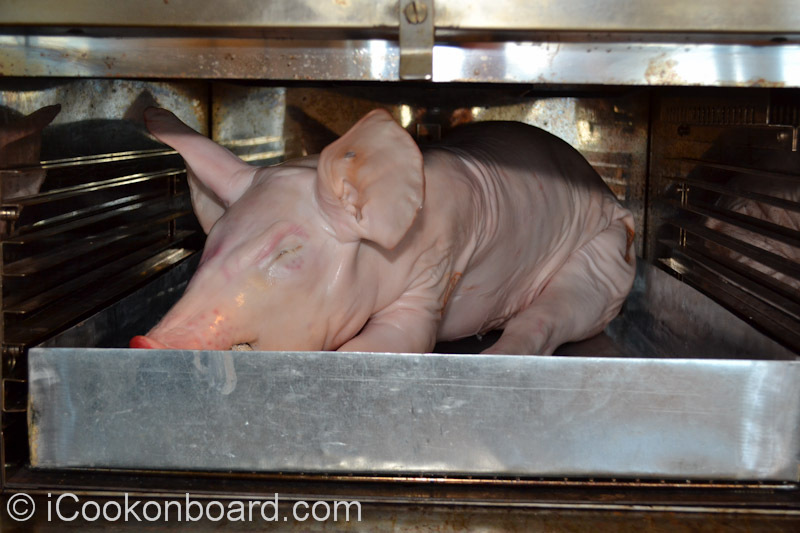 Since the heat inside the oven is not equally distributed, it is always hard to get a perfect golden brown finished on the cooked suckling pig skin when roasting inside the oven. After 3 hours or until Lechon de Leche is properly cooked, keep it aside to cool down and let the excess juice drips in the tray. Take out the alluminum foil ball from the pig mouth and replaced it with fresh red apple. Transfer in a prefered serving tray lined with fresh chinese cabbage leaves and garnish with grapes and cherry tomatoes. Merry Christmas and May you have a Prosperous New Year!!! Just a Quick info on our Suckling Pig! We received this frozen suckling pig a month before Christmas. Always order it atleast a month earlier before December to get the best quality. This suckling pig that weights 14.51Kgs. cost 100 Euros in Denmark. I must say, it is one of the best quality Suckling Pig that I cooked. 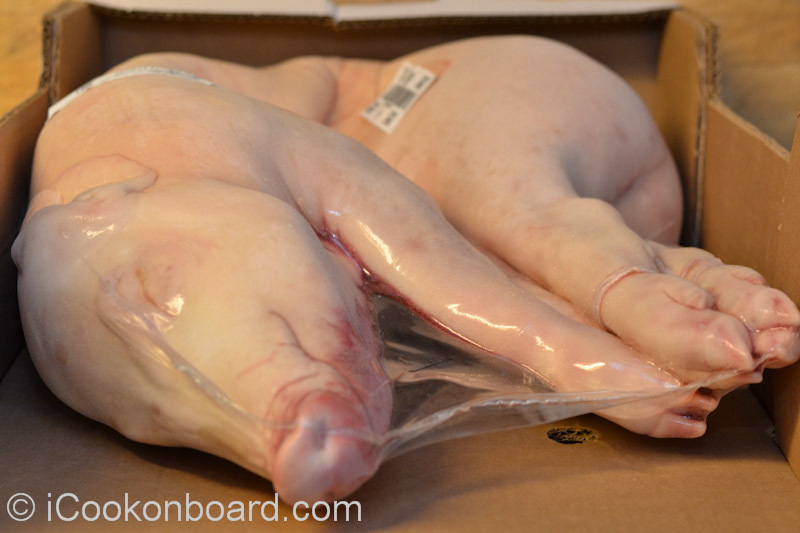 This procedure is critical and so important to achieve the best Lechon de Leche. Gather all the required ingredients. Insert the lemongrass inside the slits. Using a rope, tie both of the back legs and hang the suckling pig head side down. Additional tip: Also rub some tamatind seasonin inside the neck and insert a couple of lemongrass before stuffing it with aluminum foil. Make an apple sized crumpled alluminum foil to be placed inside the mouth of the suckling pig. Allow at least 6 hours before the Noche Buena or Medya Noche starts. Checking every 45 minutes to see which area is browning. Cover these areas with alluminum foil to avoid it from burning. 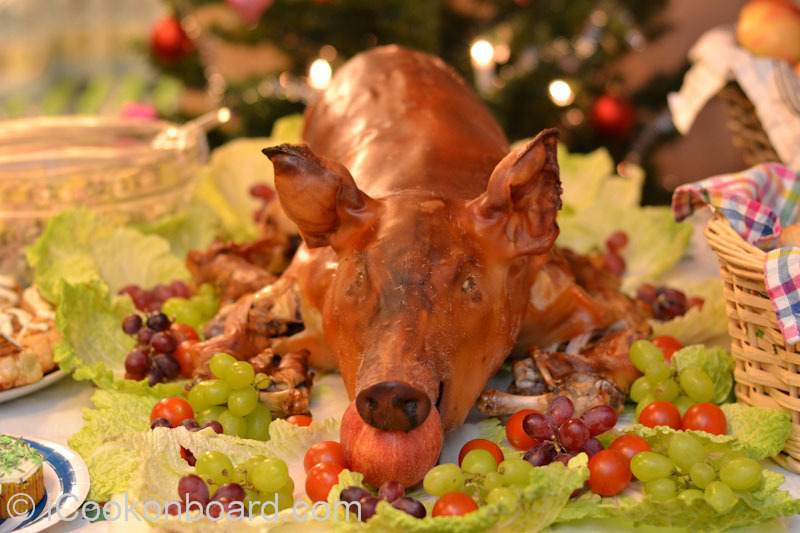 you to try roasting a Lechon de Leche for Noche Buena or Medya Noche!!! I love to dedicate this post to all Hardworking Filipinos Abroad who endure all the sacrifices just to provide their families everyday needs! I’m so proud, happy and lucky to be a part of it!!! THANK YOU GOOGLE.PH FOR THIS VIDEO. YOU GUYS ROCKS!!! You are killing me, Nino- in the best way possible- my mouth is watering reading and looking here and today is my first day as a vegetarian.. at least trying. Happy New Year, friend! I wish you success in all your future endeavours!!! Thank you for always there to cheer me up friend!